The Record Box E from Pro-Ject can turn your entire vinyl collection into high-quality digital audio without you having to empty your wallet. The USB output is automatically recognized by both Mac and Windows, eliminating the need for additional drivers. This allows you to digitize your records without complicated installation procedures and makes it compatible with virtually any recording software. The compact SMD amplification circuitry is inspired by the notorious Dr. Sykora and is designed to make your records sound clear and rich through either of the digital USB or analog RCA outputs. Internal metallic shielding and gold-plated RCA terminals further ensure that the audio signal passes precisely and accurately to either your computer or home stereo system. 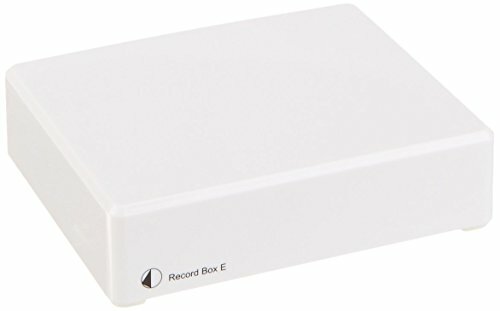 Capable of driving both MM and MC phono cartridges and available in gloss black or white, the pocket-sized Record Box E will bring your analog vinyl collection into the modern digital age without monopolizing space on your desktop or depleting your bank account. If you have any questions about this product by Pro-Ject, contact us by completing and submitting the form below. If you are looking for a specif part number, please include it with your message.